PROVENGE® What Support Is Available During My Treatment? Please contact your health care provider if you have any urgent questions about PROVENGE. Listed below are other resources that you might find helpful. In addition, Dendreon sponsors a program that provides PROVENGE, free of cost, to eligible patients with no health insurance. You can call a toll-free number, 1-877-336-3736, to obtain more information on these financial assistance services. 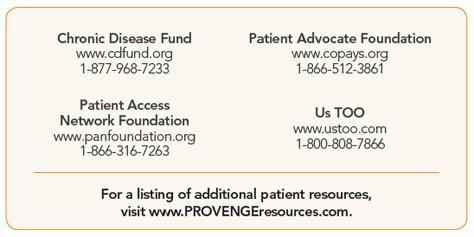 The PROVENGE Web site (www.PROVENGE.com) is another helpful resource during your treatment. You can find more information about advanced prostate cancer, how PROVENGE works, videos explaining the treatment process, and additional support resources.